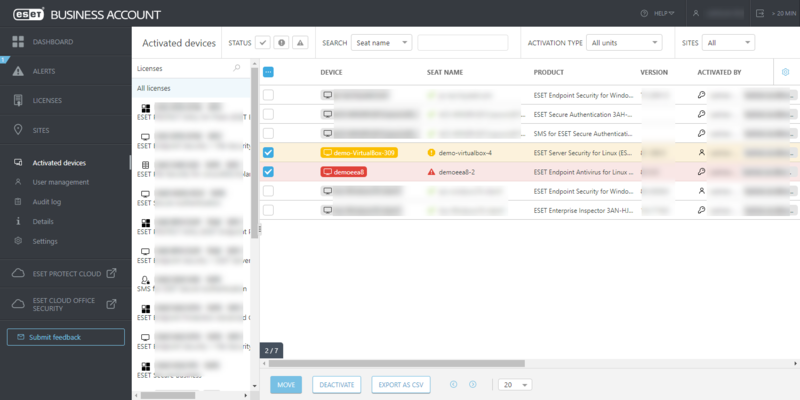 The Activated devices screen provides an overview of all ESET security endpoint products activated by any of the licenses imported to ESET Business Account portal. You can also click a license in the left-hand menu to display devices activated by that specific license or use the Search field to search for specific device(s). If you deactivate a license on a device, the device will be removed from the list of Activated devices, and the count of unused seats of that license will increase in the Licenses screen. 1.Click the row that lists the device that you want to deactivate the ESET security product on, and select Deactivate in the context menu. 2.Click Deactivate in the confirmation dialog. The device will be removed automatically from the list of Activated devices. Click Move to another site from the context menu to move an activated device to a different site. 1.Select the check box next to desired devices, or select the check box in the top row to select all displayed devices, and click Deactivate. The devices will be removed automatically from the list of Activated devices. Click Move to move an activated device to a different site.